To determine the appropriate UVB lighting for lizard, you also need to consider its natural habitat and behavior. For lizards that live near the rainforest floor that is exposed to very high UVB levels, a relatively low UVB lighting source will just be fine. However, for those who naturally came from a habitat with higher UVB levels, like forest-edge habitats, should be provided with higher levels of UVB lighting. Most bulbs are rated for the percentage of their overall radiation as emitted in the UVB range. Those categorized as low-UVB bulbs produce 1 to 2 percent UVB, moderate bulbs produce 4 to 5 percent UVB, and some high-UVB output bulbs produce about 10 percent or more of their radiation in the UVB part of the light spectrum. When buying a UVB light for your pet’s enclosure, it is necessary that you read the packaging carefully, as many bulbs are packaged as “full-spectrum” bulbs but do not actually produce UVB light. A full-spectrum fluorescent tube is a much-favored option for hobbyists as they are available in a wide variety of sizes, wattages, as well as UVB concentrations. The drawback to this type of lighting source is that they do not produce any heat at all. To keep your pet warm, you will need to install a separate basking light. Compact fluorescent bulbs have been available in the marketplace for some time now. However, independent testing in its efficacy in contributing to proper pet care is still in its early phase. Mercury vapor bulb is another lighting option. It is known to produce high levels of UVB radiation. Mercury vapor bulbs produce both light and heat. However, these bulbs are more expensive than fluorescent bulbs and may also produce too much heat for some species. It is highly recommended for chameleon keepers to provide moderate UVB levels to species from generally warm habitats. For those lizards that spend much time in the shade, bulbs that emit low UVB levels are more appropriate. Chameleons naturally seek out UVB light. However, it is not yet established whether the behavior is self-limiting as some chameleons have the tendency to expose themselves to too much UVB. As a result, they tend to develop health problems. 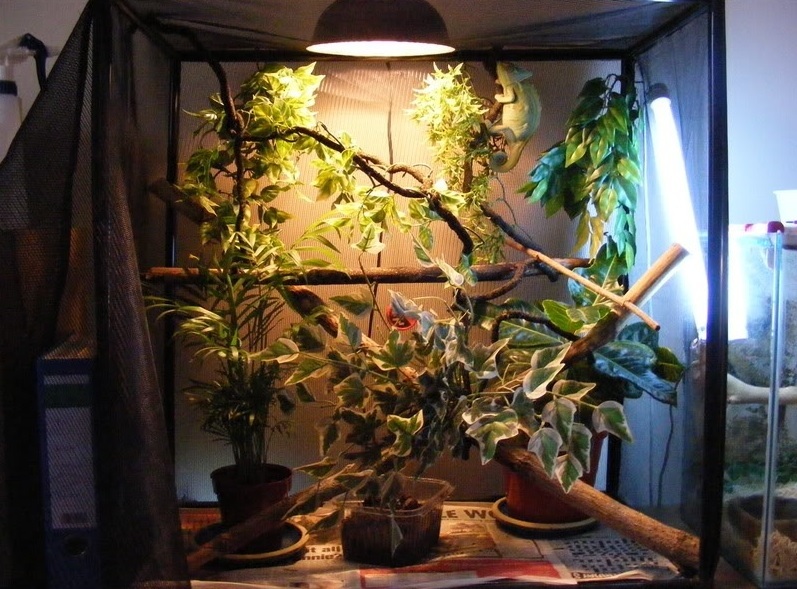 An appropriate lighting for chameleon, lights should be placed top of a screen top instead of one that is made from glass or plastic. You also need to make sure that the lizards can crawl to within a foot of the light. Also note that the light needs to be turned on for 10 to 14 hours each day, depending on the season as well as the native habitat of the chameleon. Note, however, that lighting is only part of the many other requirements of your pet to live healthy longer. Make sure that you are thoroughly knowledgeable of all things that will contribute to your pet’s overall health.